" DyeTrans Small Towel, 11" x 18", Polyester on Imaging Side, Terrycloth Cotton on the other side (with label). Transferring photographic images to these towels does not change the "feel" of the fabric. " 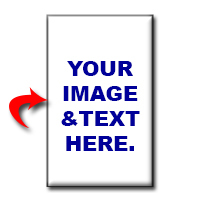 " Image Towel, 13.3" x 18", White 100% plush cotton terrycloth loop with White Polyester Imaging Strip (13.5" x 3"). "